Cem is an accomplished pianist who won several prizes in piano performance and composition. His studies at the Vienna Conservatory and Berklee College of Music provided him with a wide range of physical and musical skills. Although he has been familiarized with numerous methods, he perfected a custom one that is a combination of many methods he learned from his professors at Vienna and Boston. Strategically, setting both short and long term goals and helping students achieve these steps one by one is the key to his teaching process. Cem hasn’t set a schedule. 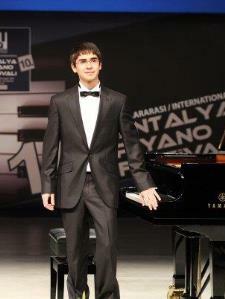 I studied piano performance at Bilkent University and Vienna Conservatory. I have been teaching piano for five years. I have studied ear training for a total of 8 years. (Bilkent University, Vienna Conservatory, and Berklee College of Music. I teach singing and hearing all intervals, recognizing chords, and solfege.